It might not seem that way when your Golden Retriever emerges from a muddy puddle, but dogs do have at least some inbuilt ability to keep themselves clean. It’s thanks to the natural oils in their skin. So a big part of grooming is about giving nature a helping hand; brushing to bring out those natural oils and helping to spread them around the skin. It all helps to maintain that glossy sheen. Through grooming, you are also removing any build up of dirt, dead hair and dandruff (something that’s good for your dog as well as your furniture!). At the same time, this is your opportunity to check that everything’s ok with your buddy, by inspecting their coat, skin, eyes, ears and teeth and checking for signs of skin irritation, infection and parasites. And did you know that hands-on contact with a dog can help reduce stress and lower blood pressure? As well as being an opportunity for bonding, grooming a dog can actually be good for us humans, too. Bristle brush: This is a good all-round brush for a range of coat types. Opt for wide-spaced bristles for brushing longer coats and narrow-spaced bristles for short-haired breeds. For coarse hair (Border Terriers, for instance), go for stiff bristles. Pinhead brushes: Because the pins tend to be longer than the bristles on bristle brushes, these are good for dogs with a top layer of long to medium hair. Use this to tidy up that top layer, but also use a bristle brush to remove loose hairs. Slicker brushes: Great for picking up loose hair and dirt on short to medium-haired dogs and curly breeds. Wide-tooth comb: Used for removing mats and tangles. These are available in a range of teeth lengths for short, medium or long-coated dogs. Undercoat rake: For the likes of Retrievers and Spitz breeds where there is a short, thick undercoat and a longer top layer. These are good at getting through the top layer and getting down to the undercoat, breaking up tangles and clearing away loose fur. Grooming mitt: A “hands-on” way of removing dirt and dead hair from a shorter coat. Cotton buds: Used for clearing away dirt and debris from around the eyes, ears and face. Short, smooth coats. Using a bristle brush or grooming mitt, brush gently from front to back, making sure that you brush all the way down to the skin. Medium-length, dense, curly or double coats. Inspect the entire coat for tangles or matting and remove these with a matting comb. To avoid pulling at the skin, take hold of the area of hair with one hand and comb out the matt with the other. Long, silky coats. Carefully go over the coat with a pinhead brush, checking for any tangles along the way. For very clumpy matting or tangles, you can use baby oil or liquid detangler to free them up. Finally, go over the entire coat with a wide-spaced bristle brush. Again, this is breed specific. But as a general guide, short, smooth coats should be brushed at least once a week, medium coats every other day and longer coats on a daily basis. 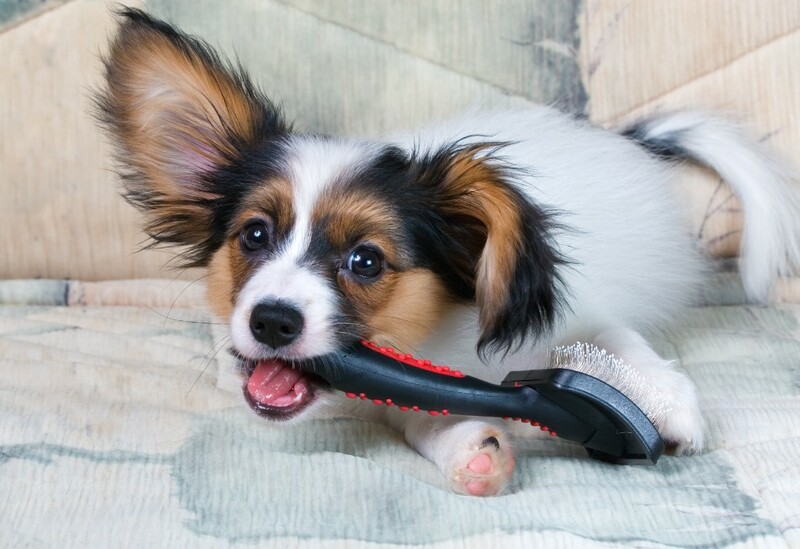 With puppies, take a “little and often” approach to grooming. By giving them a quick and gentle once-over with a brush (even when they don’t need it), they gradually get used to the whole process. Also, give plenty of praise while grooming and reward them at the end with a treat or their favourite toy. This way, it becomes associated with fun - rather than a stressful ordeal. Even many short-haired breeds benefit from hair clipping every few months to help keep their coat manageable. For the likes of the Afghan Hound and Labradoodle, clipping is recommended every four to six weeks. Once or twice a year, most terriers, spaniels and several other breeds benefit from stripping, whereby the old coat is systematically removed, leaving room for the new one to grow evenly. In the right hands, stripping should be a simple, pain-free process (pros use a stripping stone or stripping knife). A typical grooming session costs around £30-£50 and slightly more for a hand-strip: a good investment for a hassle-free clip or strip. Rule number one on bathing: don’t overdo it! Too much bathing can interfere with the production of natural oils, dry out the skin and reduce the strength of the coat. 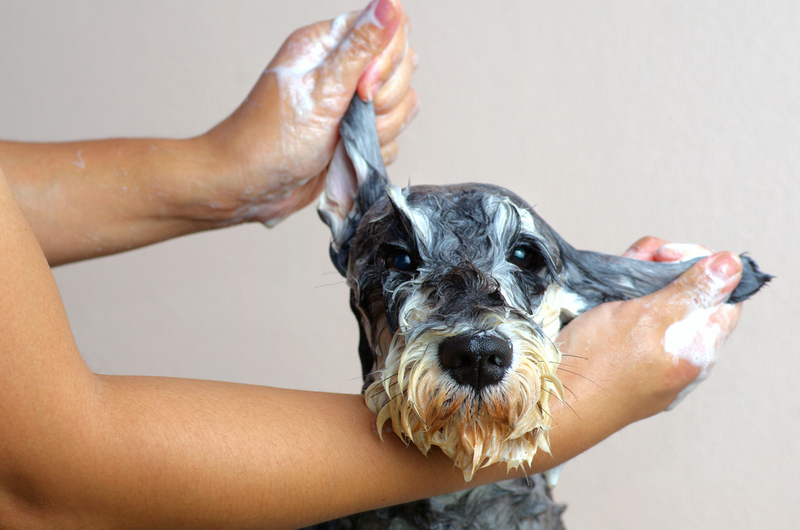 Unless your vet advises on more frequent bathing, dogs only generally needs a bath if the coat is visibly dirty or if it smells! Get a shower-mixer tap. It makes the job of rinsing the coat so much more efficient! Only use dog shampoo. The pH balance of canine skin differs from that of humans. Dog shampoo is formulated to reflect this. Brush your dog beforehand. Matts should be removed as they hold water and cause irritation so make sure you remove them before bath time. Temperature: warm, not hot! Keep it lukewarm - a similar temperature as for a human baby. Check the shampoo instructions. With some types, you need to dilute before use. Be sure to rinse well, as any soap left in the hair can lead to irritation. Towels are usually best. Hot air from blow dryers can cause dryness of the skin.